Live Laugh Louise is a shop owned by two friends, both named Louise. I call them quilting Louise and guitar Louise. The store is in Seaford on Long Island and carries only handcrafted items. I met both ladies when I was doing events at The Milleridge Inn. I’m so glad they asked me and Alegna Soap® to be included when they opened. 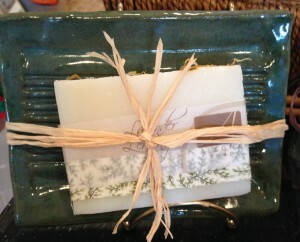 Pictured above is my Lavender Lemongrass soap on a soap dish. One of the nice gifts you can find there.